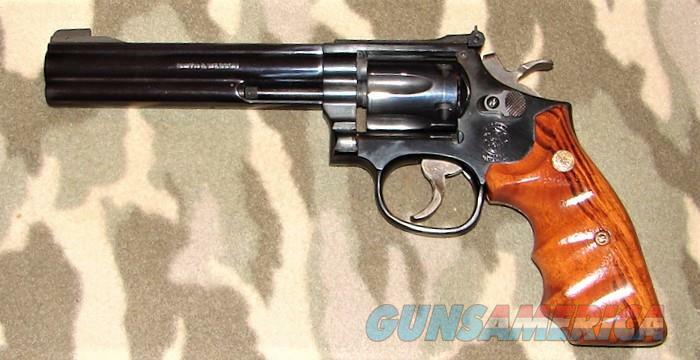 Description: Smith & Wesson model 17-6 double action revolver serial #BEE9547, 22LR, 6" barrel with a bright excellent bore. The metal surfaces retain 99% original blue finish with minor handling marks and a light turn ring on the cylinder. The smooth walnut finger groove grips with S&W medallions rate excellent with one minor quarter size scratch at the bottom of the right stock. Features include adjustable back rear/front sights, target hammer and target trigger. This firearm appears to have seen very little usage. There is no box or papers.